On Thursday I mentioned I purchased 2 new-to-me types of produce. One being Orange Kabocha Squash and the other item was a Blondee Apple I actually got as a free sample at my local produce stand. Of course I hit up Google for more info on both of these foods and here is some of what I found out. Kabocha Squash is grown in Fall, Winter, and Spring and is a Winter Keeper meaning that it can last 4 to 5 months! YAY! They are said to be one of the sweetest types of squash! I read they pair well with Broccoli, Raab, Radicchio, and Dandelions. You can roast it for 30 minutes in the oven with little effort. I like that! And I really am drawn to this recipe that I found, too! My last trip to my favorite local produce stand wasn't the first time I noticed them offering free samples of something. This time I took them up on the offer! 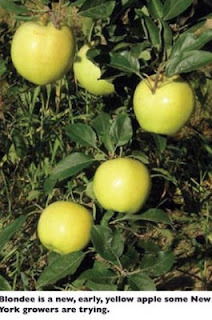 They had small, yellow apples which were called Blondee Apples. They are a lot like Gala Apples. They were originally found growing among Galas and some people actually call them the "Yellow Gala". I read that these apples are resistant to bruising...that's a PLUS! And can be kept for several months in the refrigerator! Eventho this is becoming popular in New York State - and I actually live in Pennsylvania - but right ON the state line - it doesn't shock me that I found them here now that I do know more about them. BUT this apple was introduced in 2000 by a couple from Ohio. It wasn't available to the market until 2012. I'm writing this prior to actually TRYING the apple but I am looking forward to it. I LOVE trying new types of produce! What's the last thing you tried that was new-to-you? What are those in the first pic? Never seen them before. Orange squash? Here, if we say orange squash, we actually mean the drink we get by mixing orange cordial with water. I will have to look up that drink! Sounds interesting! We grow the kobo has with green skin and orange flesh, which are wonderful paird with coconut in soup; see our blog. I haven't tried anything new for a whil, but from my local market I've had tangy dragon fruit, sweet golden and pink kiwis and a Caribbean fruit called soursop which I loved. White sweet potatoes with purple skin were also new to me a couple of years ago. We love them so much we even grew them in our polytunnel one year! I will have to check out your blog for that for sure! Thanks! Dragon Fruit! LOVE it but VERY expensive where I am! I would love to see pink kiwis! WOW! I have been having Soursop flavored things but haven't had a fresh one yet! I've never had Kabocha squash either. I'm super interested in the apples. Gala are one of my favorite apples! The lat new to me produce I tried was a Pepino melon. I also tried a new to me apple, but I can't remember what it was called! Your Pepino Melon looked great! I was super interested in that as well! I have seen there are plenty of new types of apples coming out the last few years, too! Exciting! I wish I had a local produce stall nearby! We don't seem to get many swash varieties here. I'm trying to think what the latest new to me produce I tried was, but it's difficult! I recently discovered fennel though, which i know is so common, but I really like it. My mum grows the leaves in her garden but I'd never tried the root before and its so good slowly caramelised. Fresh Fennel is hard to find here, too! I have had dried but not much fresh! Kabocha is one of my favorite squashes, it has such a sweet and rich flavor - great score! I think purple carrots were the latest new veggie I've tried. We got some organic ones from a store when we were staying in London and they were lovely. I LOVE Purple Carrots but haven't seen a lot of them around here. I need to try more 'hot pots'. I haven't had Daikon in years! Hard to find near me! And I don't know if I have ever had Taro (fresh). Eeeeeeek! I need to get into turnips more, too, it's been a while...I'm clueless when it comes to turnips! I have done them roasted but they didn't turn out that great! I will have to check out that link and recipe! Thanks! 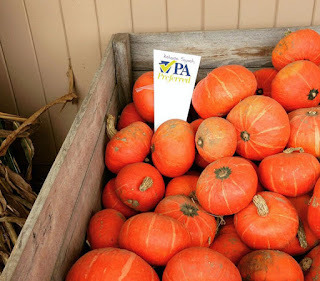 I love Kabocha pumpkin, it`s perfect for pies and muffins. I love your blog. Where are you from? Nice to meet you and see you soon! Thanks so much for dropping by! And for the feedback! I live in Pennsylvania now :) And you? Oooh I've never tried either of those. I like kabocha squash, but have never seen the orange variety. And the apple looks good! The recipe for the salad you found looks good! I really like gala apples, so I bet I'd like these too =) I like that it is bruise resistant. I know what you mean - bruised apples are the PITS!